From the moment the CALIFORNIA XTREME FIGHTING (CXF) banner was dusted off from a 7-year absence and resurrected by Lights Out Promotions and Bash Entertainment, fight fans have received a steady burst of sports entertainment unmatched by any other promotion in Southern California. The introduction of CXF Championship Title Bouts and Tournamentshas upped the ante even higher. As local fighters clamor for a chance to hoist up CXF gold, the World Famous Sportsmen's Lodge in Studio City looks to expand seating to accommodate the already capacity crowds. This Saturday's CXF 10: FALL BRAWL will be no different. 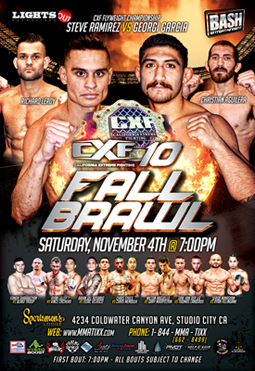 Saturday November 4th marks the 10th CXF MMA show in 20 months and will be highlighted by yet another CXF TITLE BOUT as Champion Steve Ramirez takes on worthy challenger Georgie Garcia. 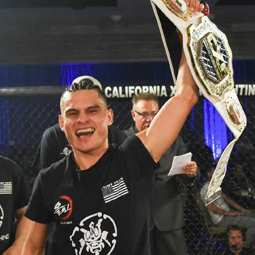 TCR: What does the CXF Flyweight title represent to you as a fighter? SR: "This title represents a step closer to making this sport a career." TCR: What do you know about your opponent? SR: "He is a good wrestler / muay thai fighter." TCR: How would you describe California Xtreme Fighting as a promotion? SR: "It's the the door to the big show. 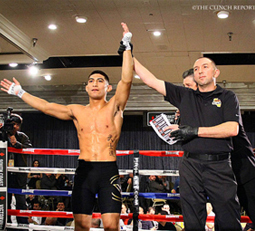 CXF is a great promotion for Californian up-and-coming fighters. Every fight is well matched which is why I've never seen an event that lacks exciting fights in CXF." TCR: Look into your crystal ball, and predict how the fight will play out? SR: "I will frustrate him with my striking and he will rely on his wrestling. That is when I will catch him in a scramble with a submission. That's if he doesn't get knocked out before he tries to wrestle. Overall, it will be a great entertaining fight." 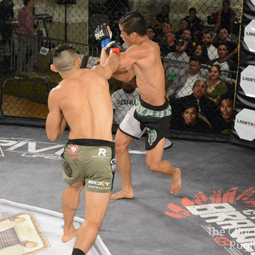 GG: "The CXF flyweight title means a lot to me. More than just a belt. It represents the hard work I put in to get to this position. It represents one giant step in my career. And it represents a story." GG: "I know a lot about my opponent. We were supposed to fight at the beginning of our pro careers. He's a strong southpaw who has a good left hand." GG: "CXF as a promotion is a great show. They've done a fantastic job at putting on exciting fights and getting all the fighters exposure on the local circuit. And for the local fans, it's a great opportunity to come and watch these fights. In one word the show is described as "fireworks""
GG: "In my crystal ball, I predict me winning. Becoming the new flyweight champion. Whether it be a finish or a decision. No doubt in my mind I will be raising the belt." 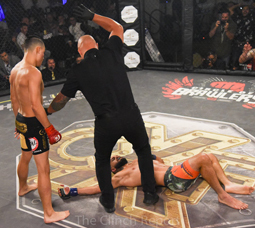 CXF 10: 'FALL BRAWL' is presented by Lights Out Promotions and Bash Entertainment and takes place on Saturday, November 4, 2017 at Sportsmen's Lodge in Studio City, California.